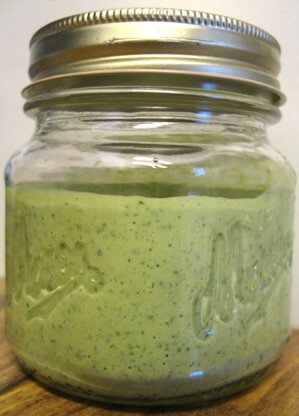 Salad dressing heaven… basil lime vinaigrette | Hey Bernice! I made this salad dressing on the weekend to serve on a garden salad with lunch. Our guests loved it and asked for the recipe… so here it is. It will keep in the fridge for about a week to ten days, and is best removed from the fridge for a little while before serving (to allow the olive oil to warm-up). I served it with Cos lettuce, cooked asparagus slices, roasted (cut in half) baby Roma tomatoes, and sliced cucumber – so delicious! Thanks Bernice! Looking forward to trying on the scallops. Will be giving it a whirl on the salad though this weekend. Trimmed back my wild basil plant today (finally managed to beat the catterpillars!) and will be giving this a whirl tomorrow. wow this is fantastic! love all the flavors, how they combine and yet tasting each of them in the dressing. It depends on how you are using it eg. dressing a salad in a large bowl, or pouring it over food on plated individually. I would say 6-8 people to be safe.